Register with Online Auto Dealer Ed and complete our online, State mandated course instantly online. Complete our 16 hour pre license course. Print your certificate instantly from the comfort of your home. The printed certificate will serve as your proof of course completion. 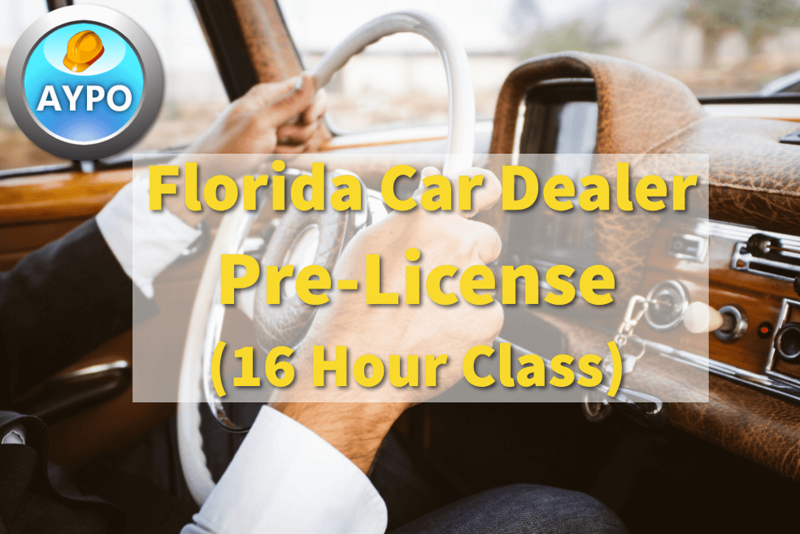 This course will meet the requirements for all of the following dealer licenses: Franchised motor vehicle dealer (VF), Independent motor vehicle dealer (VI), Wholesale motor vehicle dealer (VW), Motor vehicle auction (VA), and Salvage motor vehicle dealer (SD). Course material includes classes on dealer licensing and operations, compliance requirements, laws and regulations, and much more. At the end of your class you will receive your Certificate of Completion for filing with the DMV. This was very informative and educational. Provide the forms/links and additional information for download (separate tab/section). The course was very informative, I learned alot about the auto industry. This course was very challenging but great, I'm so proud of myself. This Course is a little longer then I thought, but I made it. It was full of Information. And easy to follow along each lesson. Very organized! Loved working at my own pace!! I found the course to be very informative and highly educational. I hope to enroll in this course in the future when I file with DMV my annual renewal applications. Very thorough with great customer support. there were points of crossover between mobile home and recreational that I didn't know would be helpful. The course is very detailed and has a lot of good information for someone that is looking to apply for a dealer license. It was fairly easy to navigate and provided a thorough understanding to get me ready for the final test. amazing and very informational. I feel much more prepared. Course is thorough and easy to follow. Lots of good information. Very informative and informational. Very easy to learn. VERY SIMPLE TO UNDERSTAND . You can do it in your own time. It's perfect. IS JUST SO DETAILING, LOVE IT! Very comprehensive. Easy to learn at your own pace. Overall I leaned a lot and the course was very informative. This course was packed with information and straight forward. I enjoyed and will recommended course. Very helpful and I recommend it to anyone wanting to become a used car dealer. Loved the course! I was able to complete on my own time and it was very informational. this course is awesome it has a lot of good information. Great course. Learnt a lot. A lot of topics are clear now. It was easy to function. Easy to navigate course, and very informative! I like the portal was easy to navigate and understand. I did it in the comfort of my home with no pressure. I recommend anyone who desires to obtain a dealer license to do it hrough this website “onlineautodealered” it’s a no brainer to do it here. The course was easy to navigate and simple to access. I GIVE THIS COURSE A FIVE BECAUSE IT HELP ME HOW TO GET A DEALERSHIP LICENSE. I will recommend this course to a person who wants to become a dealer. Excelente super instrutivo, y explicativo, Le brindo una tremenda felicitaciones por tan excelente curso. Se lo recomiendo a todos. I highly recommend this course to anyone looking to get Dealer License. Learned a lot! Easy to navigate and understand. Very informative and easy to use format. Thorough lessons. Learned alot. Information seems up to date. VERY INFORMATIONAL COURSE, EASY TO FOLLOW. Very educational course and very user friendly. Course was very easy to understand. very good and definitely stimulating. Well done. Easy to navigate and very responsive web site. Learned a lot..!! the course was veer knowledgeable but the timing was to long for some questions. It was ok, other than the time limits hampered my progress because I had to wait alot. Very informative, learned alot, didn't imagine so much was involved. Glad I took this course. This course was very interesting .Notes were easy to read and comprehend for students to have success and attain passing rate . Very good easy to follow sections of the course. I prefer online courses, thank you for approving this course. The course was very effective and informative. Some parts of the course was repetitive which allowed the material to be more understandable and embedded in my brain. The course was positively great and met my expectations. Thank you. The course is a very thorough and excellent knowledge of the industry, and I would recommend this course to all newcomers. Was a great course, very thorough and informative. It was great being able to learn and take the course as I found time in my busy schedule. Thank you. Course was great, and informative, worked well with my schedule and I'm very excited! I had issues at first but they very extremely helpful and prompt about fixing the issues. I will be recommending this course. Amanda was amazing and really helped. thank you. Simple and easy to understand and navigate site. Great course everything is put together nicely and easy to remember. I THINK IT WAS VERY INFORMATIVE I LEARNED A LOT. Very thorough and informative course. I was able to learn things I thought I knew, but I was mistaken. Glad I did it this way. I have really enjoyed this course. It was really informative, and I can admit that I learned a whole lot. A friend of mine referred me to your course, and I do not regret at all taking his advice. There should be a review guide that you can go over before the quiz, other than that the course is fine. Some sections took a little long and on several occasions had to re-do entire sections due to autosave not working correctly but decent overall. Love it , i was able to do it when I can . Everyday I did something. Highly recommend. very informative study sheets make a great reference binder to have and use throughout your business career. was very helpful. i have learned a lot through this course. thank you. Good course. Good ease of use. It was a very simple course great information. Excellent course, I learned a lot of useful and new things for myself. I am confident that this knowledge will benefit me in my future work. Thank you! Informative, well summarized and straight to the point teaching. thank you the course was very beneficial. I learned alot of great things i needed to know! Very educational i give the 5 stars. Great Course. Easy to understand and do! I loved the course it was great. I feel that your company has everything in your study for all information to pass the test and do well in having information needed to operate a business. Straight forward. I can read faster than the timer on each page but understand it must be 16 hours. Course was very helpful and provided plenty of information. Very easy nicely organized and easy to understand. I FINE THIS COURSE IS INFORMATIVE FOR ANY TYPE OF BUSINESSES AND STATE LAWS. A well designed course, thorough and easy to follow. this is a really eazy and the people are very help fule thank you. i thought it be harder but it was pretty easy. Very informative and organized very well. the course was interesting, wish there where more printable notes that had all the steps to get the license and info for all contacts that will be needed. Awesome format, I enjoyed the ease of navigation. IT WAS EXCELLENT I ENJOYED IT..
Well organized, informative, and enjoyable. Great experience. I learned a lot more than I previously had known. Excellent course, recommended to everyone who wants to start in the world of car sales. Thank you very much for teaching me so much. I enjoyed the course because it clearly explained what material I misunderstood and showed me the correct information. The course was helpful in passing the exam. The best all around including customer service. This class is great:) I loved it. very helpfull. it give enough information ans very clear. It is easy. And it teaches you a lot. Very weel set up course with all the information need it and very user friedly. It would be nice to be able to get a copy of the course to keep as a point reference for future reviews and refreshment for ourselves. Is it available, for purchase somewhere? Thank you. Very thorough and easy to use software. Provides great information for dealers. Course was fair and accurate. The course if full of valuable information and easy to navigate. Great course, very informative and yet not overbearing. Very informative and detailed. Didn't like that if I went back to re-read a topic, the timer would start running again. Also, I read faster than the given time and would have to wait too long to go to the next topic. Good solid information about becoming a dealer. The course was very informative and I found the navigation to be very easy. Good descriptive course really helped me learned a plethora of new things about the industry. This course is very informative and provide the necessary information needed in order to fully comprehend the rules to which to abide by. I lean a lot thank u I really appreciate this experience and learn it's thought me some much it's explainedable thank you. NEED TO HAVE A PDF FILE. The course was great and I enjoy it give you all 5 star. Thank you. great course, very easy and informative. very inform able. Give you enough time to complete. It is all very good but I wish there was a part that walks you through the actual selling process from when the customer want to buy the car the process of the way the paper work needs to be handled and what all has to be present. IN GREAT DETAIL so we can see what the actual process looks like. very nice course, it could have voice instructor. Course was very informative,i also find the course to be very interesting,i definitely recommend this course. Liked the fact that the lessons were timed. You are not able to rush through the course, forces you to read in its entirety. Recommend adding a total of 5-10 multiple choice questions. Great course! The course was convenient, definitely longer than 16 hours, very repetitive and educational. I liked it! A litte boring but very informative and explanatory. There is a lot of repetitive material in this course but I did take away so much needed information. The course is easy to follow however a lot of the tax information seemed repetitive. It would help to have charts indicating what is taxable, what is exempt and what is required for the exemptions. Other than that the course was easy going. Pretty repetitive course work. Lots of reading and technical details on motor homes and RV issues. It's good. Wish there were videos to help retain all the information. The course allow you to take your time and this allow you to take it easy on yourself and schedules. While reviewing Lessons, after completion and before TEST, the timer application may be halt and reader may be allowed to retrieve any page without waiting for timer to allow for NEXT page. Pace was a little slow but otherwise great course. Course is well laid out, but I would have preferred some video components to help explain the more complex material. The quiz had a few questions not covered in program overall happy to obtain the license. very knowledgable and learned a lot from this course. slight confusion in some sections. The material was quite long. Would like to see more fun interaction between the student and the course for example activities that would change the course pace since its a lot of reading. Videos would be nice too. Would like to see courses with videos it was a lot of reading and at times it was hard to continue with the course. The course was great... it could definitely upgrade and add in videos. I say add in videos because I feel it will help in the timer aspect. Some of the reads were shorter than the time given, in other words; too long. Absolutely informative! The course was very informative, and I would recommend it to anyone that needs a dealers license. Sometimes I would get kicked off a section and have to start over. but other than that it really helped me learn a lot about owning a dealership license. There was an abundance of information that will not be used by an independent motor vehicle dealer. The course was very informative and helpful. I learned quite a bit. I LEARNED A LOT VERY TRICKY MAKES YOU THINK A LOT THANKS. This was a very well organized corse. that showed me and broke all the information so that I can comprehend. There are a few issues with the flow of the system. for some reason one of the sections said I had completed it, but I had not. Luckily I was able to go back and get access to the section. It was smooth, however, if you do it on your cell phone and you receive a phone call or leave the page without logging out; sometimes it will restart the entire section. The timers need to be shorter. I can read the whole page in half the time it gives me. But it was a good course. Information was good. The only negative was waiting to be able to turn to the next page. Maybe I read faster than the norm but there was a lot of wasted time just sitting waiting for the button to change. The Course was through, but just very dry and boring. If there was sound or more games and quizzes in each section to make sure you grasping the material or to help with the comprehension. Have to learn have save on slide and not go back to beginning to chapter . This course was great! It gave a lot of useful information. The only concern I had, was that the course went into laws and requirements for licenses that I am not going for. There should be separate courses for the other licenses. No. The duration for each slide is far too long. I feel that even an average reader will should be able to read the slide in half the time. Great Presentation and informative slide decks. The save functionality could be better to return you to your correct location, but otherwise, the course was good. The course was really informative and gave me tons of knowledge on the subject of obtaining a Florida dealer license. The course was very easy to read. There was plenty of information provided. I would have preferred to have had some video playback capabilities or short segments from an instructor. Overall- Worth the time and money spent! Some of the questions on the quiz were not part of the training. There needs to be additional sections regarding employees. It would be nice to have some videos in this course. So much reading!!!! The course is somewhat informative, a bit hard to follow and EXTREMELY boring. It meets the requirements for certification. Make sure you have plenty of coffee on hand! The course was informative. However, some slides were timed far too long. Especially on the information that does not pertain to my field. I also feel the format is extremely dated. While the course met the needs of the state, I would thoroughly suggest an update. The monotony was nearly overwhelming at a few points during the course. I literally "dozed off" on more than one occasion. Would have rather had someone reading the text instead of having to read everything. I believe the passages are too long which you get only 1 question asked through the entire passage to then deal with an additional 50 pop quiz which you're being timed on. I suggest that the passages are limited because it does get boring to read 20 passages but get only 1 question asked. I feel the writing should be updated. The training seemed a bit outdated but was none the less informative. The course was thorough, however, the time limits were too long and there was no indication of what the final test would consist of or how many questions total there would be or how you had to complete it. no option for class to be read out loud. The course included a lot of information that is referenceable. The course should work to boil down the truly required content and have the refeerenceable information looked up. Technical bugs, question wordings that have grammatical mistakes. Too much content that is not relevant to specific license variety. Good material but NO videos. This made the course more difficult to absorb/process.